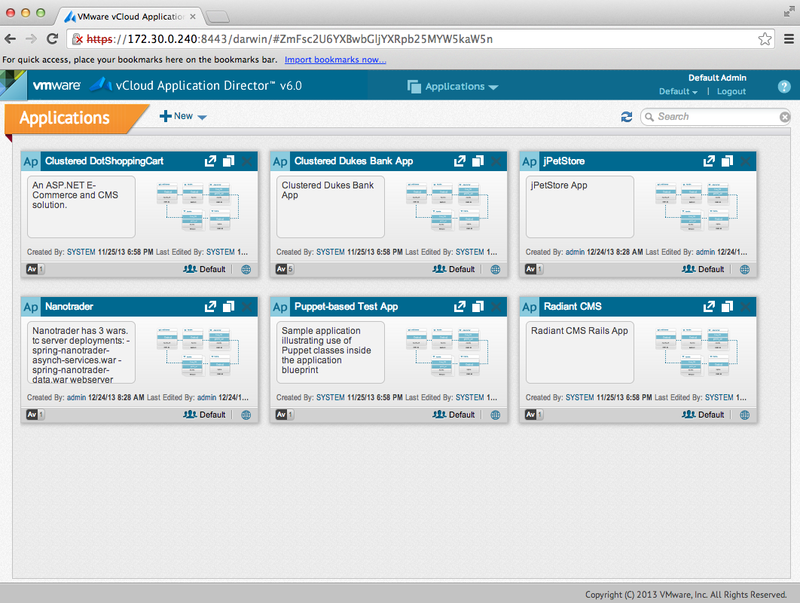 After publishing my two-part series on automating vCAC 6.0 installation and configuration here and here, I received an interesting inquiry on how to automate vCloud Application Director (AppD) deployment and configuration. Given that I had a couple of days before winding down for the holidays and for my upcoming trip, I took my final challenge of 2013. The challenge with trying to automate AppD deployment, even though it is distributed as a Virtual Appliance is that it requires user interaction during the first bootup. A user must provide a valid AppD license key which then allows AppD service to start up and the user must also change both the root and admin account as part of the bootup process. This is not ideal from an automation standpoint as it prevents anyone from automating the deployment and configuration of AppD. In my opinion, these configurations should have been part of the OVF properties which can then be specified during the deployment and allow for automated/unattended deployment of AppD. Since the setup was happening during the boot process, I opted for more of an out-of-the-box solution after spending a couple of minutes looking for a workaround. The solution that I came up would require a "slight" modification to the startup scripts which is accomplished by initially mounting the VMDK of a newly deployed AppD Virtual Machine that has not been powered on. This can be done in one of two ways by either using a live-CD such as KNOPPIX or programmatically using the vSphere APIs. Once the VMDK has been mounted, you will need to rescan the guestOS to ensure the virtual disk is visible and then mount the 3rd partition of AppD Virtual Machine as seen in the screenshot below. 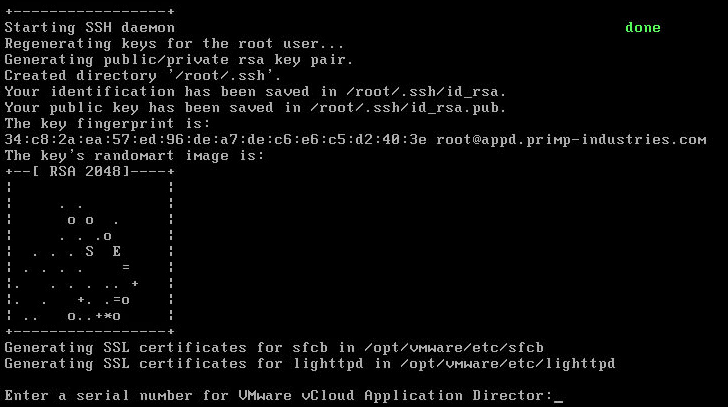 The following script /opt/vmware/etc/isv/firstboot is responsible for prompting for the license key as well as changing the passwords for the two user accounts. To allow the script to continue, we will need to comment out the following lines in the script 75-102 and 287-289 as seen in the screenshot below. At this point we are now ready to power up our AppD Virtual Machine and you will notice that AppD no longer prompts the users for input. 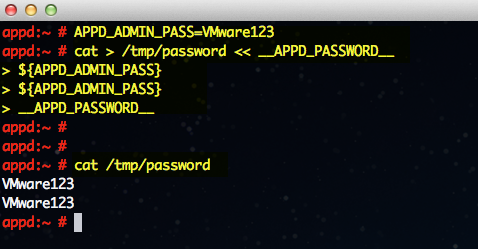 The above commands will create a new file in /tmp/password which contains the password you wish to change the admin account to. 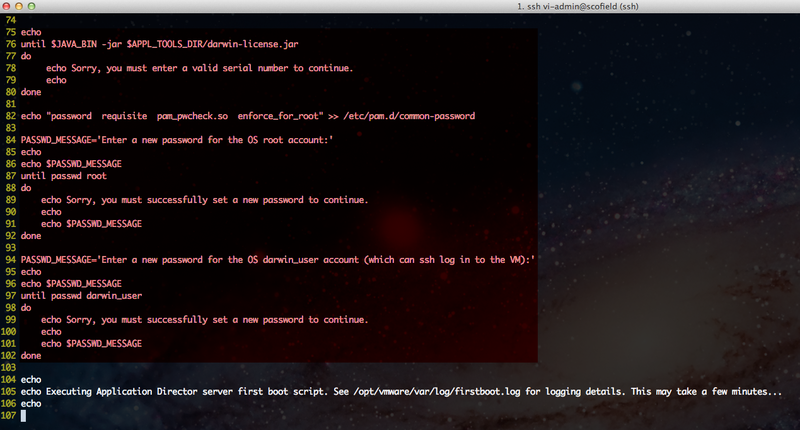 Then using the darwin-cli, we can now re-direct the file we just created and change the password without any user intervention which is great for automated configuration of AppD. 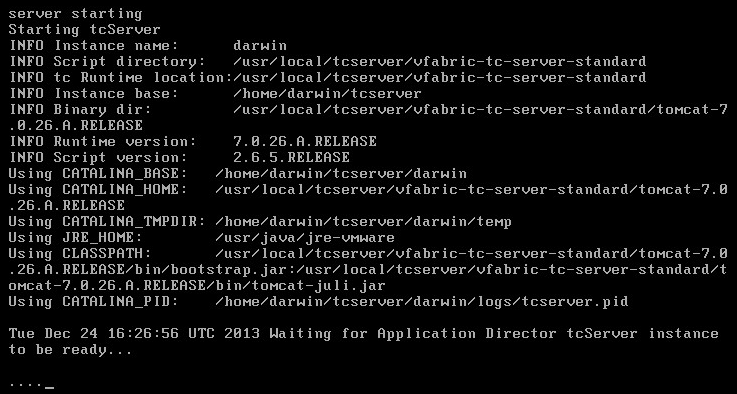 Finally, we can confirm everything was setup correctly by logging into the AppD interface by opening a browser to the following URL: https://[APPD-HOSTNAME]:8443/darwin and logging in using the admin account and password we changed earlier.